Giorgio Armani’s Emporio line is perhaps best known for its underwear, eyewear and fragrances which are the staples for its everyman. The designer’s ready-to-wear collections, however, have quite a specific man in mind and at the brand’s autumn/winter 2019 show in Milan on Monday, he emerged as an intrepid urban explorer of the jet-set variety. The house explained that the collection was “designed for a hybrid habitat”, which is “sporty but urban at its core”. It demonstrated this with velour tracksuit-style suiting, slouchy hoodies worn under stricter tailoring, and grounding each outfit with trainers or polished leather hiking boots. When Emporio Armani Man is not in the city in his sharp suits, he’s skiing or snowboarding, and this collection has him well kitted out for both. Designing for this guy is essentially what Armani does best and, while it may not hold the widespread appeal of those other more accessible products, it pays off. Forbes ranks the 84-year-old designer as No 174 on its list of billionaires in 2018, estimating his net worth at $7.6bn (£5.9bn). At Fendi later in the day was another hybrid of sorts as its creative director, Karl Lagerfeld, took on the roles of creator and subject for the first time. The show was a tribute to the German designer (who also heads up Chanel as well as his eponymous brand), intended to celebrate “close to a lifetime of mentorship and mutual respect” between the Fendi family and its adopted designer of more than 50 years. As such, Lagerfeld could, quite literally, be seen all over this collection. A drawing of his unmistakable ponytailed profile was one of the many doodles to adorn shirts, trenchcoats and a huge quilted puffa coat. It was an apt season-defining detail given that the 85-year-old is famed for his sketches and having his pencil case close to hand at all times. 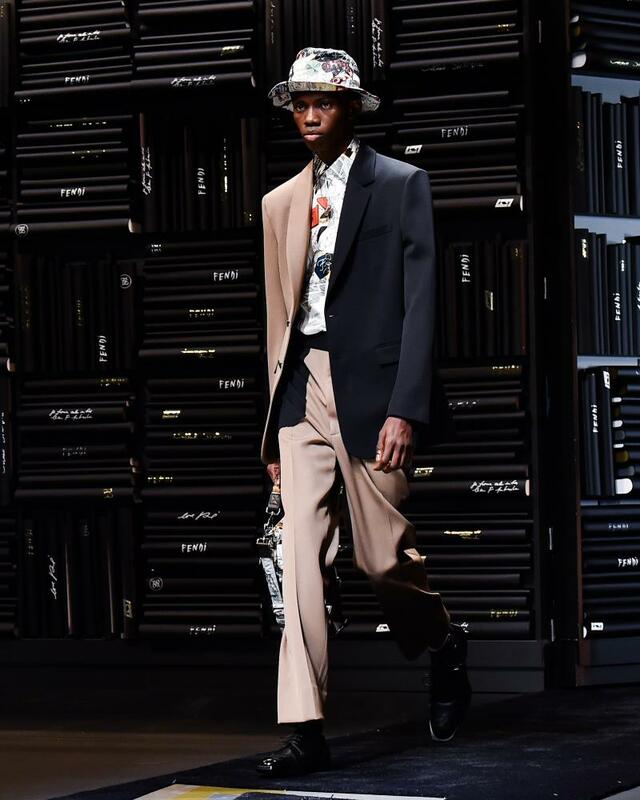 “Dualism is in the DNA of Fendi, under every form,” said his co-designer, Silvia Venturini Fendi, pointing to their long-term collaboration and the other prominent concept in this collection. It was realised in two-tone tailoring which fused wool-tweed with silk-organza, zip detailing which split knitwear and jackets down the back, and the house’s interlocking F logo, which was calligraphic on a long duster coat. The tribute is well bestowed given that Fendi and Lagerfeld have proved to be a fruitful pair. Fendi’s owner, LVMH, recently cited strong growth at the brand as a contributing factor to its €42.6bn (£37.9bn) in revenues in 2017 – an increase of 13% on the previous year.